Once a month, three local filmmakers showcase comedy sketches in a variety-show style at The Village Theatre. The name of the show may be grammatically incorrect — which the hosts playfully pointed out with a hilarious drunken voicemail they received condemning their apostrophe faux pas — but “Ladie’s Night” is anything but ill conceived. “Ladie’s Night,” the only show in Atlanta to meld sketch comedy and stand-up, features comedy sketches from the “Ladie’s Night” team as well as four sketches submitted by local groups and stand-up comedians performing brief sets between films. “We decided to create ‘Ladie’s Night’ as a way to motivate ourselves and others in the comedy scene. It gives everyone a deadline every month to finish a project. There’s no submission fee, and there’s no admission price, so if you’re making something for the show, it’s purely because you want to push yourself,” host Zach Lamplugh said. Audience members are entertained at every moment of “Ladie’s Night” — the comedy sketches are quick and witty, and brief stand-up pieces provide stimulating variation. 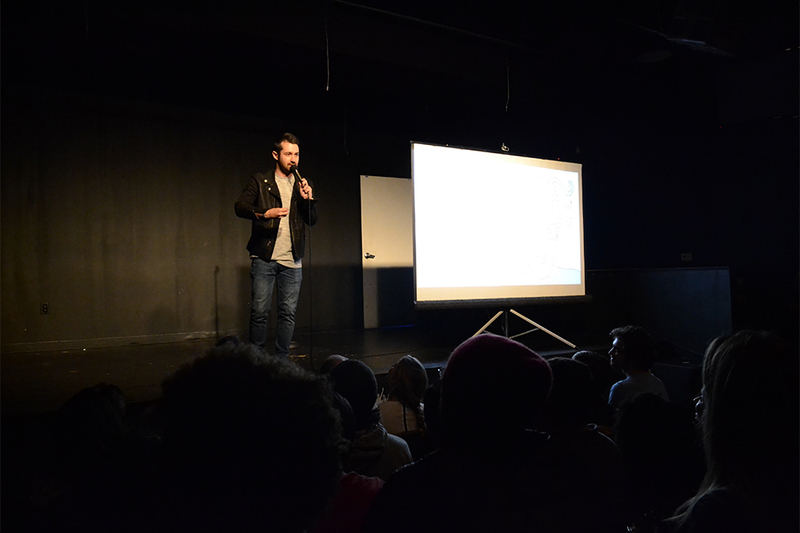 This month included stand-up acts from Dedrick Flynn, Andrew Markle, Paige Bowman and Trey Dunn. For a show that begins at nearly 11:00 p.m., everyone seemed awake, alert and amused. “The comedy scene in Atlanta is amazing, it is one of the reasons I moved to Atlanta. Just this past season on ‘Last Comic Standing’ featured five comics from Atlanta; not to mention one of those five, Clayton English, won the whole season. Over these last few years the comedy scene in Atlanta has been getting more national notice. A lot of locals were featured as ‘New Faces’ at the ‘Just for Laughs’ comedy festival, and one of them, Caleb Syan, was just on ‘Conan’ a few months ago,” Lamplugh said. At the end of the show, audience members can vote for their favorite performance of each of the submitted shorts. The winning team is granted a spot to defend their title next month. “The submission block we run is fairly simple … that is the way we designed it. A lot of festivals or shows like ours have a rigorous entry process or a submission fee. We wanted to encourage people to just work on shorts and have an audience to show them in front of,” Lamplugh said. “The impact has been great. Bringing out these guest judges is a huge kick for the submitting teams and the audience alike. It is a really cool thing to know that people that have worked on shows like ‘Aqua Teen Hunger Force,’ ‘Your Pretty Face is Going to Hell,’ ‘Archer’ and more watched your short,” added Lamplugh. The “Ladie’s Night” teams’ sketches typically star the part-colleagues, part-friends and part-roommates — Zach, Brian and Joel — encountering some absurd scenario set against the banality of ordinary life.